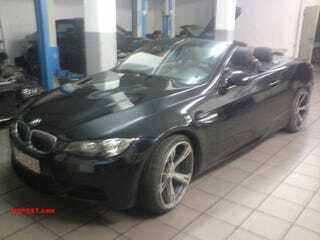 First E93 M3 Convertible Spied In Shop? Here's a bit of mystery for you, the sporty motormen at the M3Post forum captured an image of what appears to be an E93 M3 convertible. But this ain't your mama's as-of-yet-unreleased M3. This one comes complete with 21" AC Schnitzer wheels and the license plate is from Heinsberg and the shots are from Aachen, where AC Schnitzer is based. But this isn't just a regular 3-series convertible mistaken for an M3, this is definitely an M.